This was my second consecutive visit to Jaipur Literature Festival (JLF). During my last visit, I reserved myself mostly to the sessions and had little or no interaction with the fellow attendees. But this time, I made sure that I interact and take away more from the largest literary gathering of the world. I visited on the 23rd January, 3rd day of the event. My first stop was Front Lawns that had house full attendance. I am too young to associate with Woodstock but this place was closest literary version of Woodstock. 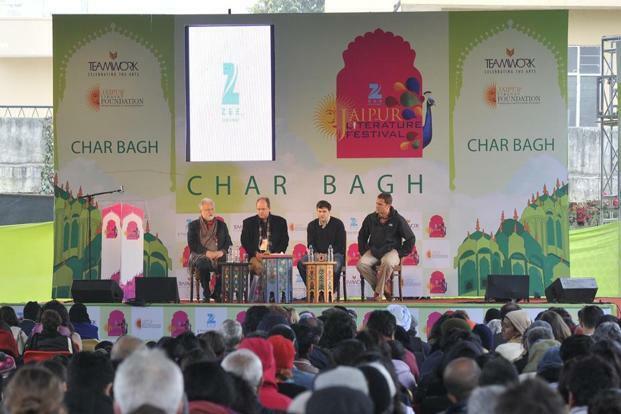 In the cold winter morning, huge crowd was waiting for the session on “The Conflict of Dharma in the Mahabharata” with the panel consisting of co-director of JLF Namita Gokhale, Shiva Trilogy sensation Amish Tripathi and Bibek Debroy. Audience were the most diversified group you will ever witness in any cultural gathering in India. The proportion of outsiders were higher than locals. Tourists, resident Westerners in India, families of different foreign diplomats, Authors, Journalists, students and other literature enthusiasts were sipping masala chais & listening to the session on the world’s largest mythological tale from India. It was great group to be part of. Seema has been visiting JLF since 2009 from Noida. She has witnessed this event to grow in to stature and become a mark-off event in the calenders of all literature lovers around the world. However, she miss the previous versions of the event when crowd was lesser and authors/speakers were more approachable. I somewhat agree with her. There were many noisy groups in the lawn that had no idea why they were at JLF. Also, arrangements were insufficient for the gathering as in most of the sessions, there were audience waiting behind the rows of chairs and there were always long queues for washrooms, bookstore and book signings. Eleanor Catton is the youngest booker’s prize winner that she had won in 2013 for her brilliant novel The Luminaries. However, during the session on Art of Historical Fiction, she was very nervous and could not translate her thoughts in to words. To be honest, it was a relief to see an author to be nervous in public speaking. Most of the authors are projected as great speakers but it’s reassuring to find some of them humanly imperfect. In the session “The Twilight Zone: Between Arabs and Israelis” moderated by former Indian representative to UN Security Council, Hardeep Singh Puri hosted a very outspoken and pragmatic panel. While popular Israeli journalist Gideon LeBor was critical on the Israel’s right wing politicians, the famous poet Fady Joudah brought the much needed Palestinian point of view in the discussion. I saw lot of empathy in the audience, even few had moist eyes when Fady read out one of his poems on the children of Palestine. Many schools in Jaipur had organized a trip for their students to JLF. The idea was good and I was really envious of these kids for the kind of opportunity they have in this age. I spoke to Megha and Raghav, who were looking visibly bored in their maroon blazers. They were here to attend a session by the former President of India, Dr APJ Abdul Kalam but they were not really trilled about it, particularly considering it was a Saturday afternoon. “I don’t care much about books and literature, I will rather stay at home & watch TV” said Raghav. I wish he could unsay that. Shashi Tharoor is one of the best author from India. Currently, he is a Member of Parliament and active member of Indian National Congress. His session was mostly taken away by his mocking of Government’s Clean India mission and gaining sympathies from the majority of the politically liberal audience on his reservation of the current conservative government of India. I would rather listen to Shashi Tharoor discussing his books & writing on Lit Fests, than the usual TV news channel kind interviewique talks. I have lived in Jaipur for two years and went there in 2007 I guess with a friend who was not much of a book lover!! And I din’t attend any events. I am not surprised that great authors are not great speakers. Actually, there was a survey done which claimed that words flow beautifully on paper when people can’t find any other way to spill them out like speaking. Thank you. It has really changed in stature from 2007. 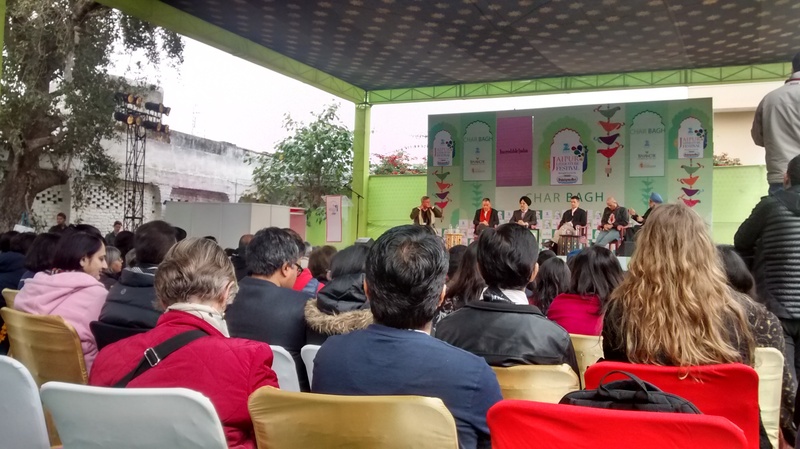 When JLF started in 2006, it had merely 100 visitors that included misguided tourists. It was also focused more on Jaipur’s Heritage, rather than only literature back then. Enjoyed reading this account of your time at JLF. I had read something similar about Tharoor’s session – in some newspaper. Well, what can we expect from a politician!!! I am sure the Mahabharata session would have been quite interesting. Thank you. I am glad you enjoyed the post. Mahabharata session was interesting but maybe I expected more from it. I attended one fest in Mumbai last year. There was a Ashwin Sanghi-Shubh Vilas combo. Both were wonderful orators. The former, I witnessed for first time, but the latter I’ve known personally as an outstanding speaker. He’s the one who held Bhagwad Gita classes at ISKCON. I was there in that session. It was the Nonfiction lit fest I guess. I actually bought Ramayana- The game of life after that session. Also I had read Ashwin’s books earlier, Chanakya and The Krishna Key- both flirted with history/mythology and triller combo. Oh, you were? You visit most lit fests? I’ll try to emulate you more. My actions were just ur opposite. I had already read Ramayana, but purchased Sanghi’s books later. So, do you agree that author visibility gives a boost to book sales? Hmm, need to stay awake and alert for LitFests happening across India. How do u keep abreast of events? Yup, please do that! I’m quite a novice at using Twitter. Previous Post Draupadi: an inspiration for Chanakya?